When it comes to seafood, I prefer mine deep-fried and served in a paper-lined basket. Utensils are optional and a roll of paper towels will work just fine to clean up the mess. If the view is good and the beer is cold that is all the better although I have had some mighty fine food in cinderblock hole-in-the-walls and corner shacks. Regardless of the structure in which they are housed, “come as you are” places serve the best seafood. These are places where the clientele is an eclectic mix of locals and “I drove to get here” folks that share a common love of flip-flops and fresh seafood. It’s unpretentious dining and I’d gladly give up a table at the hottest restaurant in town to sit in a beaten-up vinyl chair and dig in to a plate heaped with golden seafood. After all, it’s hard to find anything to complain about when you are munching on fried shrimp and enjoying cheese grits out of a styrofoam bowl. Here in Charlotte, far from the sea, my favorite hole-in-the-walls specialize in barbecue. The vibe is similar. Macaroni and cheese is served in place of cheese grits and the sweet tea may be a tad bit sweeter, but the folks that crowd the interior to the point where you have to turn to the side to pass between tables, are the same. They are here for the food and it is piled high. I’m always up for barbecue, but I miss not having the coast closer. 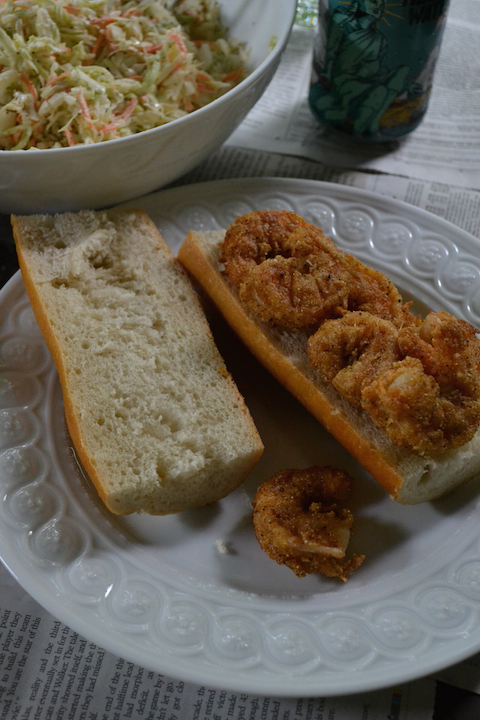 I’m a Gulf Coast girl and there are times when one just needs a fried seafood platter which is how I ended up making this classic New Orleans sandwich on a Tuesday. Happy cooking! 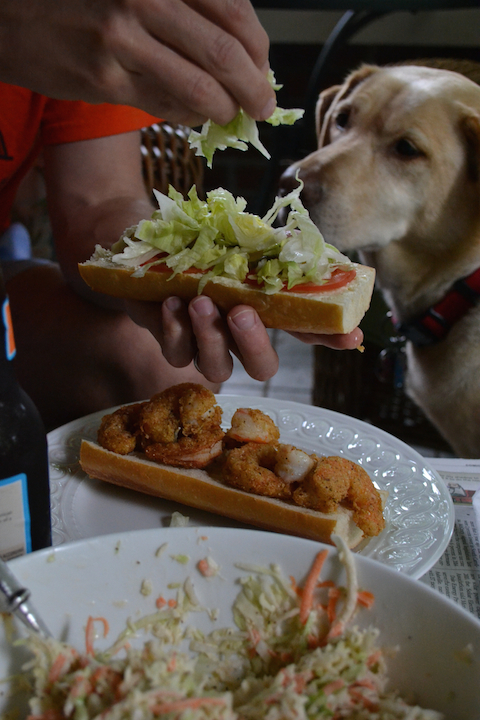 The quality of the shrimp determines the tastiness of your sandwich. Seek out the freshest shrimp you can find and you won’t be disappointed. You can omit the buttermilk and just bread the shrimp in the cornmeal mixture, but you won’t have as good of crust on the shrimp and the shrimp will be a bit drier than those that took a buttermilk dip. A demanding baby and a lack of time resulted in me using mayonnaise, but I had plans to make a spicy remoulade to spread on this sandwich. Good, homemade tartar sauce would also be delicious. In a small bowl, whisk together the buttermilk, Tabasco, and 1 teaspoon salt. In another small bowl, whisk together the cornmeal, flour, ground red “cayenne” pepper, Old Bay seasoning, remaining 1 ½ teaspoons salt, and ground black pepper. Working with one shrimp at a time, dip each shrimp into the buttermilk mixture and then dredge it in the cornmeal mixture. Place on a wire rack and repeat with the remaining shrimp. Meanwhile, fill a high-sided frying pan or Dutch oven with the oil to a depth of a scant ½-inch. Heat over medium high heat to 350 degrees or until a piece of cornmeal mixture dropped in the oil floats immediately to the top. Place several paper towels on a dinner plate. Carefully add the dredged shrimp in two batches, frying into golden brown. This will take about 1-½ minutes per shrimp provided they are small. Gently flip the shrimp with a slotted spatula halfway through the cooking time. 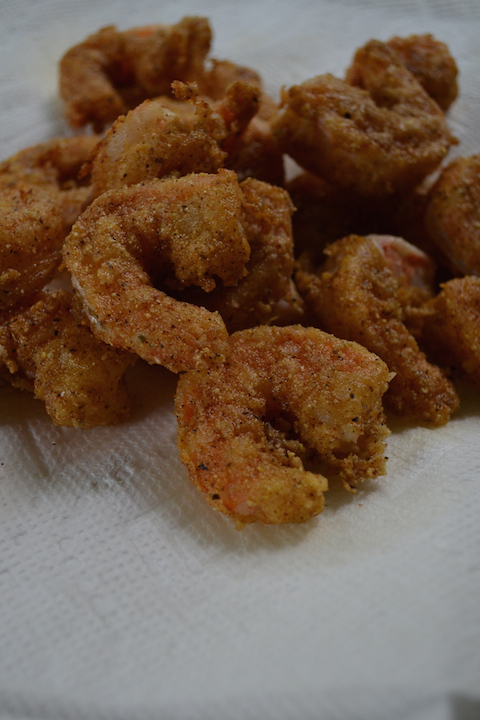 Remove the fried shrimp from the skillet and set them on paper towels. Spread mayonnaise on one half of the sandwich bread and top with half the shrimp. Add lettuce, tomato slices, and pickles to taste. Enjoy with a cold beer and good company.